With different brands of turmeric herbal supplements on the market, it’s very confusing to know the ideal supplement. We have done some research on Kyolic Curcumin that will help you to come up with the best conclusion. Curcumin is the main ingredient found in turmeric, and it helps to fight inflammation. According to the manufacturer of Kyolic Curcumin, the product has cardiovascular benefits, helps in joint functions and it aids in liver health. The two components found in Kyolic Curcumin are well known and recognised to have unyielding antioxidant properties. 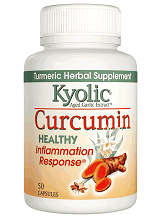 Here is more information on Kyolic Curcumin. Other inactive ingredients that are present in this product include gelatin, silica, magnesium stearate, and cellulose. This product is free from dairy, sugar, gluten, artificial colors, flavors, sodium, yeast and preservatives. It’s a vegetarian-friendly product, but those people who suffer from soy allergy should avoid Kyolic Curcumin. Kyolic recommends that an individual should take at least two capsules of their product daily and with a meal. There is no direct pricing listed on the website. The product comes in bottles of 50 capsules and 100 capsules. You are not able to directly purchase Curcumin on the Kyolic website, but you can buy the product via third party websites like iHerbs and Amazon. According to Amazon, a bottle of 50 capsules costs $16.88, and 100 capsules costs $30.50, plus the shipping charges. There are no side effects for this product that have been reported. However, a high dosage of curcumin supplements can cause gastrointestinal problems. The most common digestive problems include stomachache, nausea, gas, and indigestion. Talk to your doctor if you get these side effects. It’s not advisable for people who have gallbladder and kidney problems to take any product that has curcumin. Pregnant women are advised not to take a curcumin supplement since it can cause shedding of uterus lining hence causing miscarriage. This product is a vegetarian-friendly product, but those people who suffer from soy allergy should avoid Kyolic Curcumin. Since the product is not sold directly from the website, there are no reviews found about this product. They do not have any notable guarantee or even a return policy on their website. Consumers have to rely on individual retailers where the Kyolic Curcumin product is sold for their return policies. This product is made of the finest combination of ingredients that are excellent with positive reviews from the individual retailer’s websites. On the other hand, this product is a little pricey compared to other similar products on the market. One bottle of 50 capsules lasts only for 25 days if taken according to the instructions. Plus, the lack of a product guarantee from the manufacturer’s website will give a customer a second deliberation about the effectiveness of this product.